Objects which are temporarily captured into an Earth-Moon system orbit (temporarily captured orbiters or TCOs) by definition will leave this orbit. While the term suggest an Earth orbit, it's really an n-body orbit involving the gravitational effects of the Moon and Sun as well. They are also sometimes referred to as "mini-moons". Upon exiting, can TCOs go as far out as the asteroid belt, or do they then just orbit the Sun in a heliocentric orbit very similar to the Earth's 1 AU? Has anyone tracked or calculated the orbit of a known TCO to this extent? As a side question (it can be split this off separately if necessary) have any of these been larger than say 10 meters in diameter? No answers after a week, so I will put a toe into the water an make a rough estimate. I think a thorough answer would require both a significant 3D orbital dynamics simulation with a million particles, and a way to define dynamically a threshold for what passing bodies would be considered "just barely temporarily captured" and which *not quite temporarily captured". There should in fact be some good papers to cite that report this kind of simulation. I'll try to look around; I think there is a good opportunity for one or two more answers here. Also see Have there been any documented mini-moons since 2006 RH120? and all of the sources linked there! 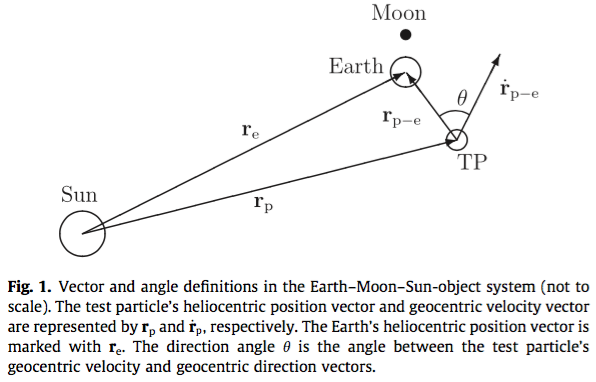 An example of an object in a medium-term stable orbit in the Earth-Moon system might be found in a halo orbit around the Earth-Moon L1, or L2 points. A spherical envelope-back calculation using spherical cow milk for ink suggests that in the rotating frame, it cycles in a 100,000 km orbit every two weeks around the Lagrange point, or about 0.5 km/sec in that frame. In a non-rotating Earth-centered frame, the Moon itself is moving at about 1 km/sec. Since these temporary orbits are weakly bound, I'm going to say that an object entering the Earth-Moon system at roughly 1.5 km/sec can hang around for a while, then exit with roughly that velocity. Looking inthe Sun's inertial frame now, The Earth-Moon system is moving at about 30 km/sec. That 1.5 km/sec is now looking fairly small, only about 5%. So if it exited prograde or retrograde, it would end up in a heliocentric orbit with a semi-major axis no more than 10% different than the Earth's. TCO's are NEOs that take the time to flirt with the Earth-Moon system, then continue on as NEOs to perhaps flirt again another day. EDIT: I just visited my mini-moon question, found Gravnik 2012 and realized the plots are there! Here are some of them. It turns out everything I said is right. That's not a surprise, because I believe I read this paper a few years ago. 1 billion initial conditions, 10 million particles actually integrated. 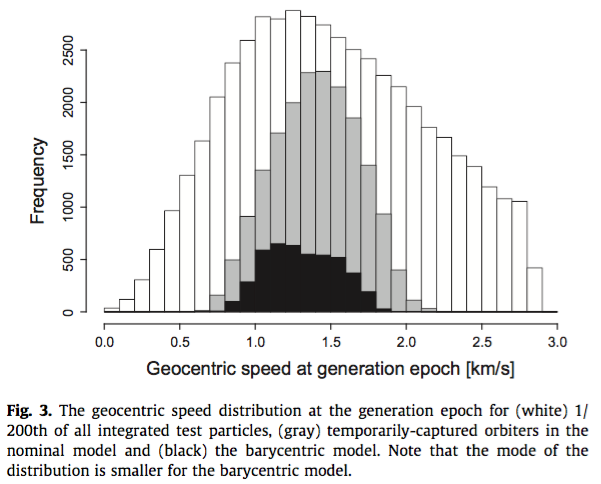 We have for the first time calculated the population characteristics of the Earth’s irregular natural satellites (NESs) that are temporarily captured from the near-Earth-object (NEO) population. The steady-state NES size–frequency and residence-time distributions were determined under the dynamical influence of all the massive bodies in the Solar System (but mainly the Sun, Earth, and Moon) for NEOs of negligible mass. To this end, we compute the NES capture probability from the NEO population as a function of the latter’s heliocentric orbital elements and combine those results with the current best estimates for the NEO size–frequency and orbital distribution. At any given time there should be at least one NES of 1-m diameter orbiting the Earth. 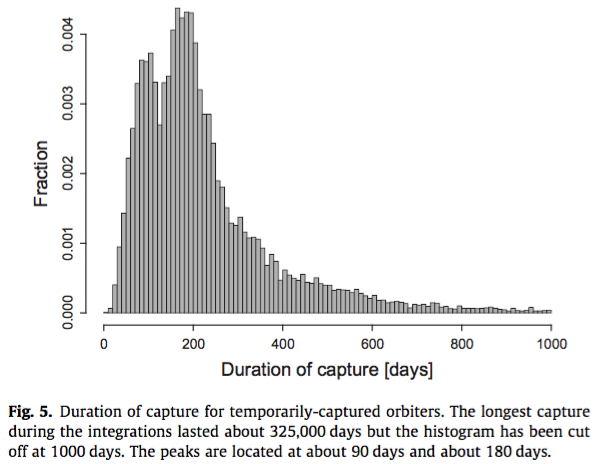 The average temporarily-captured orbiter (TCO; an object that makes at least one revolution around the Earth in a co-rotating coordinate system) completes (2.88 ± 0.82) rev around the Earth during a capture event that lasts (286 ± 18) d. We find a small preference for capture events starting in either January or July. 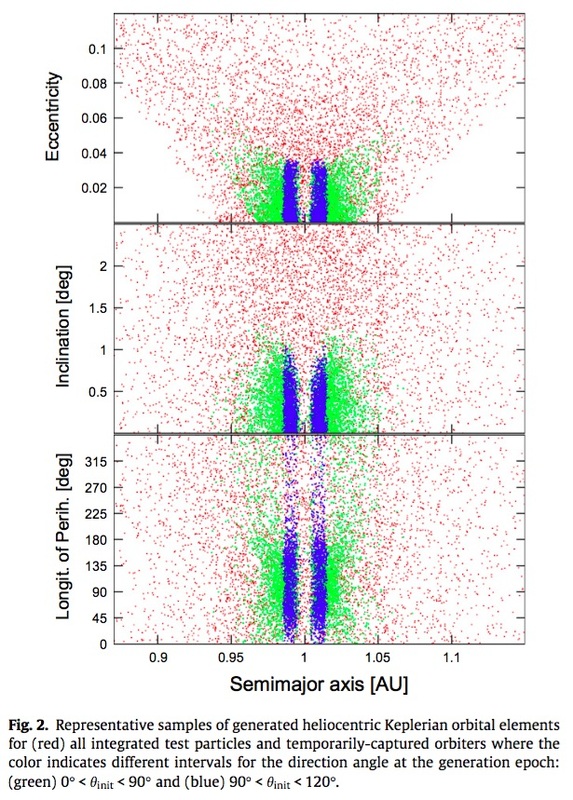 Our results are consistent with the single known natural TCO, 2006 RH120, a few-meter diameter object that was captured for about a year starting in June 2006. We estimate that about 0.1% of all meteors impacting the Earth were TCOs. Not the answer you're looking for? Browse other questions tagged orbit natural-satellites orbital-mechanics or ask your own question. How was Earth's “quasi-satellite” 2016 HO3 “first spotted” and it's orbit determined? Why doesn't the sun pull the moon away from earth? How far can the Sun and the Moon get? If the moon's orbit decays- how would it effect the moon's phases? If you lived on the far side of the Moon, how could you infer the existence of Earth? When is Earth closest to the Sun?